Last evening was the monthly meeting of our Consciousness Exploration Group; the meaning, underpinnings and origins of consciousness was central to our discussion. We also examined the effect of our thoughts on this nebulous, mysterious “energy” we call consciousness and the impact our thoughts have on our lives. Then I found this video from early 2013. I spoke about how our thoughts and our choices effect how we experience the year. This sense applies to 2014 as well. Our thoughts become our reality. Think your reality into existence every moment! Yesterday’s post was a message, as channeled by Rosemary, from The Divine Feminine. There is little I can say that will enhance their powerful message. But I do want to offer some thoughts and examples, perhaps in my way to amplify the message. My first thought in encountering the words of The Divine Feminine comes from my training and work in indigenous cultures and their understanding of this “Heart” especially as it relates to ancestors. We, as living humans, stand on the bones of our ancestors; but their hearts beat right beside our own. Many of you know Rosemary as a medium who can speak directly to our ancestors, those who have transitioned in the near past and even ancestors from generations past. They are right here with us! So, when The Divine Feminine speak of The Heart of Humanity and say: “This is not about the individual heart of a single person but, rather, the collective heart of the humans both alive and in spirit” they include our ancestors in this Heart. Why is this important? They are right here with us, watching us, cheering us on. So often their messages through Rosemary are words of pride in our achievements, words of encouragement to continue to learn the lessons and evolve, words of comfort that they are with us! Their hearts beat within The Heart of Humanity just as ours do. Live and love within this energy! My second reaction to the message is a recall of a divination card I often receive from the Goddess Guidance Oracle Cards by Doreen Virtue, PhD. Maat is a Goddess in the deck that carries the message of “fairness.” (I’ve pictured the card here.) 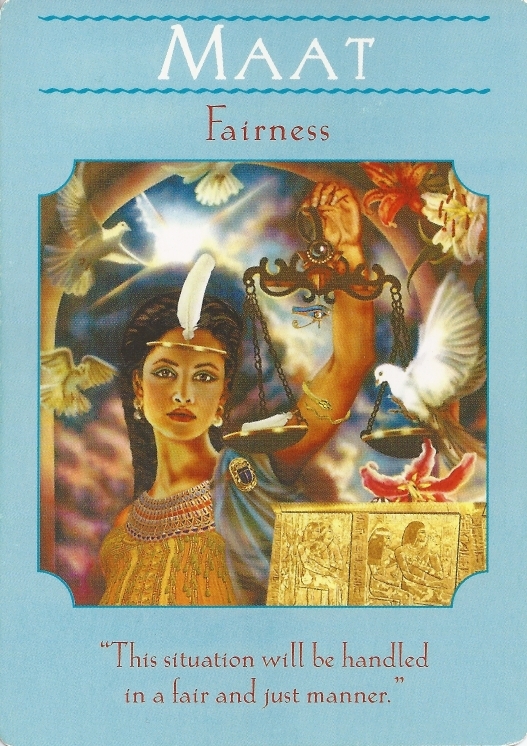 The key to understanding the message of this card is in the definition Dr. Virtue offers for fairness: “It’s when all parties involved surrender their personal agendas in favor of the greater good for the entirety of the group. This requires trust in the wisdom of the group.” And I add this requires trust in The Heart of Humanity. I like this definition of fairness a lot. And it is little wonder that I receive this card a lot! What if our justice system were based on fairness: what’s good for everyone, the common good? How did The Divine Feminine put it? – “For the good of all.” With no qualifiers. We are all in this together. Sometimes we may not like this inclusive approach to “all.” But we are all members of The Heart of Humanity! My third thought goes to our “community supported agriculture” (CSA) farm. As I write this, today is pick-up day. Each week we get a box of organic produce fresh from the fields. During this past winter we purchased a family share in the farm. Now we are getting our return on that investment. We paid our local organic farmer in advance and now receive a share. This share means we are part of a community, part of the common good; and we are sharing now in the results, good harvest or poor harvest (and so far it’s been very good! ); we share the benefit as well as the risk. Our community farm is part of The Heart of Humanity. The Heart of Humanity is about our Ancestors and what they worked hard for, it’s about fairness, and it’s about sharing in the common good. I hope you are enjoying your share in this Heart! PS: Come speak with your ancestors! They are alive in The Heart of Humanity. Your next opportunity to participate in a Conversation with The Other Side is July 13 at 7:00 pm Eastern. You can join the Conversation online via a video internet connection, or voice/phone; and if you can come to Annapolis, join Rosemary live! Get the details here. “Thoughts become things” according to Mike Dooley. They are things according to many current authors linking quantum fields and our brains (or should I say “minds”?). Our thoughts are certainly energy that is detectable, measurable and effective! The so called “new age” construct that we create our own reality through how we think and act, imagine and project our thoughts, ideas, visions into the world is becoming main stream science for those who are open and willing to explore these not-necessarily-self-evident concepts. Then whether we believe this approach or not would seem not to matter; it’s not a matter of faith but a matter of science. We don’t believe in gravity; it’s a fact that objects near the earth respond to a force by falling to the earth. “Thoughts are things” is not a belief system but as real as gravity. There’s a lot of empirical evidence to back this up. Therefore we really do have to be very aware of our thoughts, to monitor them, to assess and characterize them and to channel them in the direction we choose if we want to live a certain way. And this is particularly true if we want to change, improve the way we are living – evolve! Another common expression these days is “change your mind and change your life.” This could be the corollary to “thoughts become things.” These are easily expressed phrases, quickly becoming platitudes. But underlying their seemingly obvious simplicity things get a bit dicey. How many of you are sticking to your resolutions for 2013? That mind that runs on autopilot and habit consumes a huge percentage of our waking mental activity. It is not until we begin to assess how we are spending this “mind time” that we realize how much thought-energy is wasted. Don’t feel bad if you are already falling short on those resolutions. The routines you were living through in 2012, while not “hard-wired” into your brain, are a set of well worn pathways through neural networks laid down years ago. They are difficult to rewire! The endless loops that play and replay in our minds are wasted energy. The knee-jerk emotional energy we expend on all the little, and sometimes big, annoyances in our lives is pretty much wasted – this emotional energy seldom accomplishes anything! This is where the second, meta-mind comes in. We cannot change our minds, change our habits, change our responses unless we monitor, assess and evaluate the rightness and usefulness of those responses in the first place, when they occur. A perfect example happened to me today. I was practicing qigong. My meta-mind should have been in high-gear, right? I was present, mindful, deeply into the practice. There were some people in the neighbor’s backyard talking and I could ignore them. Then our Lhasa Apso, Tara, came on the scene. At first she was attentive but quiet. Then as she detected the outside disturbance she let out a piercing bark. I almost jumped out of my skin! Then I scolded her for disrupting my practice. It took me several moments to re-collect myself and get back in my rhythm. Later as I was reviewing this I realized my reaction was not only out of habit but also unfair. Tara’s breed is from Tibet where Lhasas were raised as temple watchdogs. Their job was to alert meditating monks and masters if there was an intrusion into the monastery! Well, Tara was doing exactly what she was bred and raised to do! And she doesn’t have a meta-mind (at least as far as I can tell) so I had no right or reason to scold her! I’m the one with the meta-mind but it didn’t wake up until after my unfairness. How’s your 2013 practice coming along? PS: To guide your thoughts for 2013 with incredible inspiration from The Divine Feminine you can get the 8 recordings I made at the end of 2012 during my Wisdom of the Week (WOW) calls. Get them here. PS: For more inspiration and incredible guidance from The Divine Feminine you can get 8 recordings I made at the end of 2012 during my Wisdom of the Week (WOW) calls. Get them here. I fully appreciate if not fully comprehend her message. It requires deep thought. Her message is essentially about union, not in a coming together of two-ness, dualism, but as in no-separation. There is no separation of spirit and body, of the Earthly Human part of us and the eternal Spirit part. Even to use the term “part” is to imply two-ness, pieces of a whole. But the message of the Guide is there are no parts here, only wholeness. This is true yoga; this wholeness is not about the joining of parts but the no-separation into parts. And as I think about it, isn’t this the true message of the Heart Sutra? Isn’t this the truth of “emptiness” and all the denials? These are the denials of separation! The denials of the senses as we think of them, sense with them. “No eye, ear, nose, tongue, body, mind…” no separation into these sensory organs that tend to deceive us. My Guide would have me know this and to go deeply into this Truth. She said the New Human is born from this Truth. The New Human is not a Spirit Being having a physical experience here on Planet Earth. The New Human is one being, a fully integrated singularity with a dimensionality that transcends the physical, emotional, mental, spiritual. The New Human is beyond the dimensions of time, space, consciousness. The New Human is even beyond Spirit because it holds all these other dimensions “nested” within the greater singularity. The New Human is a hologram and represents (no, not “represents” – “is”!) the wholeness of the Universe! From bottom to top – the lowest atom/particle to the highest conception – God – it is all one thing! Dimensions, space, time, matter, emptiness, black holes, dark matter, consciousness, spirit: these are all one and these are all inside everything and everyone. This is the true everything and nothing – the Alpha and Omega. Our senses tell a different story; they present to us the illusion of duality. The New Human sees beyond the illusions, penetrates the perceptive senses to realize the New Truth. Words fail. They are swallowed up in the greater, deeper understanding of Oneness! Everything collapses into this Oneness. The ocean overwhelms the drop of water, consuming it, embracing it into the singularity that is at the heart of it All. And what does the New Human do with this comprehension? Heat water, make tea. But there is a necessary alteration to the routine. There is a new attitude toward Life, a new consciousness regarding the All, the One. There is a subtle sense that the separation is not sustainable and that the Oneness is all pervasive through the All. There is an inter-penetration of everything, everyone, every moment, all thought, all feelings, All. With this realization everything takes on a new dimension, new clarity. There is a glow, an aura to it all that inter-penetrates my own aura. This is New Sight. And somehow the tea is more delightful! PS: Have a wonder-filled Holiday Season and many blessings in the New Year!